Neil makes a selection of craft items, from hand carved products to clothing & equipment. 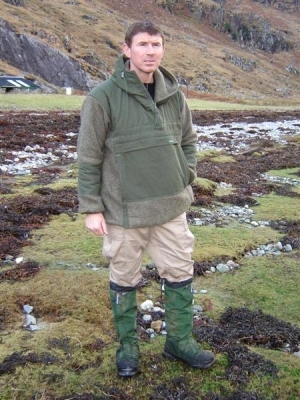 The clothing and equipment items are made and designed by Neil to perform in extreme environments. These designs are unique and based on years of experience, actually using gear in various conditions. Currently Neil's clothing range is unavailable due to a lack of time to make them. When they become available again we will change the page. A product that took five years to develop, from finding and testing combinations of materials, to getting the design features just right. This is a working garment at home when it is cold and wet in the forest and woodlands. A favourite with bushcraft instructors and forestry workers because it shrugs of sparks from a fire and rough use. It is also very popular with deerstalkers because of its warmth and near silence in use. The basic garment is constructed from the highest quality woollen blanket and is of "overhead" design. The thickness of the wool makes it very weatherproof and of course wool is naturally resilient to sparks from the fire. The smock has ventile cotton covering wear points on the shoulders, elbows and providing extra weather proofing on the hood. The smock also has a ventile map pocket on the front of the smock that sits on the huge hand warmer tunnel pocket on the front of the smock. The weather is further sealed out with knitted cuffs and a drawcorded hem. 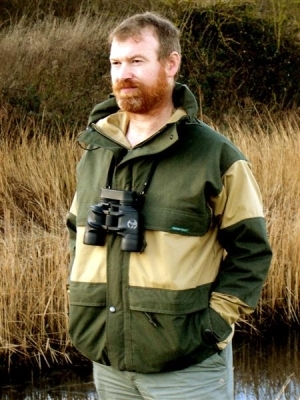 Cotton Ventile is a superb outdoor fabric, being highly breathable, weatherproof, durable and long lasting, for all of these reasons Neil has been using it to make jackets for the last ten years. His Designs are simple and Highly functional. The smocks can be used instead of a shirt in warm weather or used to keep the weather at bay in the winter months when placed over a woollen mid-layer. The unique hood design is plenty big enough to wear a hat under and fully adjustable to the users head, this allows the hood to turn with the users head. The hood also includes a wired hood for improved vision. Many people carry a multitool, in this modern age you are more likely to be changeing a plug than skinning a rabbit. 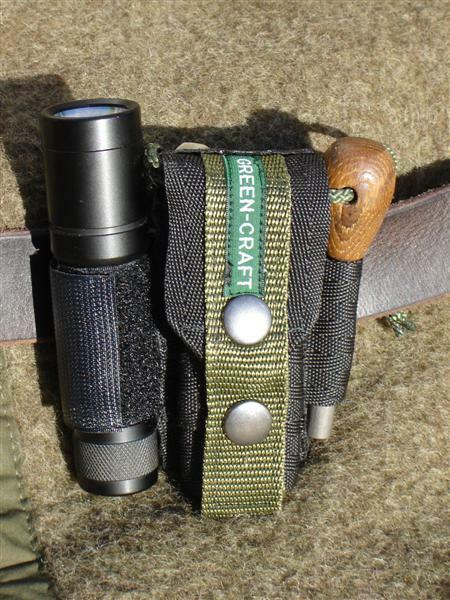 The original idea for carrying it with a firesteel and a flashlight came from a well known bushcraft instructor. Carrying all three together makes a lot of sense as it provides the functionality of the multi-tool, a source of heat for making fire and of course light for when darkness falls and all handily carried on your trouser belt (nobody goes very far without their trousers). The pouch will hold a leatherman wave or similar sized multi-tool, it has a fixed loop for a firesteel and an adjustable velcro loop for a tactical style torch (Surfire, LED Lenser, Madjak or even maglite). Please state whether left or right handed when ordering. The cost is £15 before shipping within the UK.